BATLEY BULLDOGS supporters were able to join the staff and players to celebrate the end of the season after last Sunday’s 40-6 victory over Swinton Lions. The Bulldogs have ended the season on a real high winning their last six Betfred Championship Shield fixtures, including an impressive victory away to Leigh in their penultimate game. Head coach Matt Diskin thanked his squad and backroom staff for their outstanding efforts this year, while the club also held their player of the year awards in front of supporters gathered behind the Driver Hire Glen Tomlinson Stand. Diskin awarded coaches player of the year to James Harrison, while influential back rower Brad Day scooped players player of the year and he was also the Bulldogs’ leading try scorer with 14. 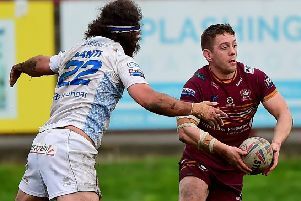 Johnny Campbell also had a superb end to the season as he scored nine tries in four matches before Swinton, including two hat-tricks, and having agreed a new deal for 2019, the Bulldogs will be hoping to get a full season out of the winger, who missed part of the 2018 campaign for personal reasons. Reittie made the 250th appearance of his career at Leigh a fortnight ago and played his 136th game for the Bulldogs against Swinton. He played 44 games for Halifax, 16 at York, 10 at Hunslet and 42 for Doncaster and has three international caps for Jamaica.